The Florence residences is a new development launch in D19 on Hougang Avenue 2. The Florence Residences condo was formerly known as Florence Regency which was bought thru an enbloc by Logan property. The Florence residences prices is exciting to watch with prices to be expected to be within $1,600 - $1,700 psf. This is still very attractive especially with the prime location and quality product provided by the developer. 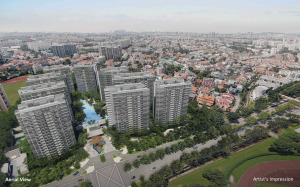 The Florence Residences showflat location is situated opposite the Actual site, right opposite the Hougang stadium. Potential buyers will be impressed with the efficient layout and site.